Description: This invitation measures 5¼" x 7¾" and printing is matte (Flat). 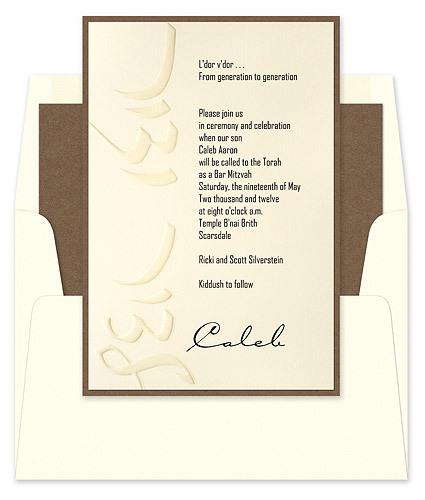 L’dor v’dor” – Hebrew for “From generation to generation” – is embossed on this sophisticated Bar Mitzvah invitation recalling family tradition. Your text is printed in deep Sable brown ink on our best cream paper layered onto our rich Chocolate brown paper. Return address, envelope upgrades and envelope linings also available for this invitation. Price includes all assembly (if necessary). Reception and Response cards also available, as well as matching thank you cards. Click here to all Bar and Bat Miztvah invitations, pricing and accompanying cards from Checkerboard.